These two poetry collections are reviewed together. There's some similarity between them: both are centred on family and myth, with metaphors both mortuary and marine. Both are worth reading, although if you've only got time for one, I'd recommend you go for Drink. I'll get to that one in a bit. 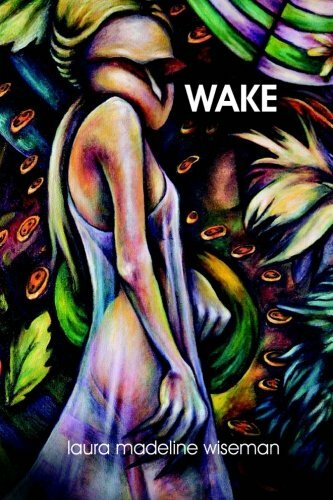 Wake is the slimmer of the two volumes, and it is primarily concerned with death—specifically, relationships with death. Before death, after death, how monsters approach death and how women do. The last of these is particularly relevant, as Wiseman's death is a woman, come in the form of a sister. This female, familiar perception is not one I've come across often—barring F.G. Haghenbeck's portrayal of Godmother Death in The Secret Book of Frida Kahlo, or Death in Neil Gaiman's Sandman series, for instance—and it gives an interesting flavour to the text, one that's underlined and simultaneously undercut by the unsympathetic portrayals of corporeal sisters. "Unsaid Negative Confession: We Hate You" (p. 49) has the poem's narrator screaming her hatred at a sister who stands block-like, impervious. Apparently she feels nothing; the hatred doesn't touch her—which is what you'd expect from a death-sister and not a blood one. Everything dies, and tantrums on the stairs make no difference. The mythological carries on, undisturbed by the messiness of human emotions and accusations. Yet the attraction remains, the sense of family loyalty even if it's one-sided. "I like monsters" says the poet (in "Preference," p. 56). Yet "My sister is a monster," claims "Barren Monsters," (p. 58) which tells of an abusive relationship between the sister and her partner, a man who hits and pulls her hair, who calls her names. The sister is infertile, presumably because "Monsters and humans can't mate". One would presume, in this case, that it's the partner who is the true monster, but biological femininity will out—the bleeding, the "extra wombs"—for body here defines monstrosity more than action. It's a classification prefigured by early behaviour. The poem "Book of Monsters" (p. 61) states that "As a girl, my sister painted her bedroom's ceiling and walls black". Black, the colour of death, of unconsciousness and falling away, if ever there was one. The monster-sister, building a habitat. Part of this dual approach is due to the nature of the collection: Wiseman takes a genre-mashing approach, creating a whole out of disparate parts, so that more realistic poems are cheek-by-jowl with explorations of fairy tales (the Little Mermaid and Snow White) and mythology. Part of it, however, harks back to the sister-relationship of death. A sister's house is a place for visits, for taking tea and gossiping—or throwing cups and slamming doors, a grand exit full of pique and refusals. "We don't go there anymore" says the poet (in "Death's House," p. 38) and it's a saying that comes with the echoes of fractured relationships and replacement, for other people are lining up to visit Death's House. Other people live there; they "tread the family carpet, watch the doors". Yet later, in "Sister Death" (p. 46), "We know it's time to visit again" and it's all reminiscences of past lives together, of parties and shared beds and thin walls so that conversations in one room can be heard in the next. The reminiscing isn't kind. It's of a bitter thank-goodness-I'm-well-out-of-it-now sort, an uneasy truce. But if that relationship has notes of realism in it, then they're overshadowed, often, by a text that values a sort of mutual, metaphorical osmosis. In "The Entrance to Death" (p. 64) the same narrator who refuses and remembers crawls over the threshold: "I'm going in. I've been there. I can come back." In "Death's Cameras" (pp. 51-52) it's "Together we'll go back to the living". But go back to what? Come back as what? As one of the women in "Anthology of the Dead" (p. 40) who gather under an advertising flyer, lured in to tell stories of their own deaths, their own murders? Stories of being strangled, of being framed as a suicide, of the betrayal of sisters and mothers (by sisters and by mothers? or just by daughters?). And these stories they tell—how real are they anyway? Are they just fairy stories of another kind? Ariel the amnesiac mermaid, making things up because "Anyone would forget an event that turned every step into a feeling of knives" (in "Considering Lore," p. 39). It's a focused collection, Wake, albeit with a focus that blurs to ghost each action with metaphor and myth trailing behind like incense. That focus makes for a very interconnected text that can be a little repetitive but at least is certain of what it is: a study in death and sisterhood, one that stalks behind with a rotting welcome mat. I read Wake before I read Drink, and really it would have been better to have read them the other way around. Drink appears to be the more foundational work, and large portions of it are dedicated to the portrayal of an abusive, alcoholic mother and the resulting suicide attempt of a sister. 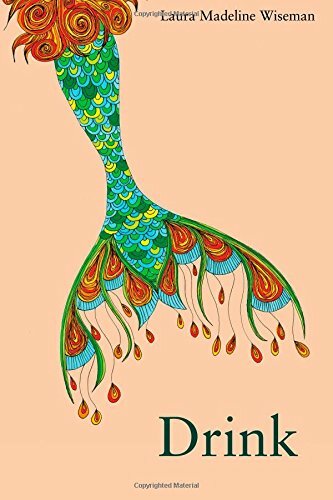 The effects of alcohol, of drink, are contrasted in this collection with the imagery of—and poems on—mermaids. It seems an odd combination, at first, and one that relies on wordplay—in the drink, on the drink, and so on. Bottles piling up in the rubbish bin of a cheap motel room; bottles sinking to the ocean floor and being used as toys. Empty bottles broken up and used for art; empty bottles filled with seawater and messages. But the wordplay is underpinned by deeper connections—the varying myths and realities of modern life. The poem "On Vanishing" (p. 19) makes this particularly clear. After the disappearance of a plane, possible reasons for that disappearance get stranger and stranger, delving into science fiction and controversy. Then "Someone says, Mermaids. Another says, This is about lack of security, welfare moms. There's no such thing as mermaids." The myths of the past, of half-human, half-fish sea creatures are being replaced by the myths of the present: the welfare mother as the reason for social (and aeronautical) collapse, the ever-present expectation of terrorism as the new lurking monster under the bed (in the hold). These myths expand into our social consciousness. Given that this is a book about mothers and daughters, the myth of the welfare mother holds special weight. Unemployed and slovenly, bearing multiple children to different fathers and spending her money unwisely. A scourge to her daughters, violent and abusive. That it appears to be true in this case—the sequence of poems in Drink where the mother ignores a daughter's suicide attempt, telling her boyfriend du jour, on being confronted with that daughter's failing body, to "Step over her, Joe. Step over her" ("Complicit IV," p. 63) is particularly horrifying—doesn't mean that the exception is the rule. Unless, of course, we're mythmaking. Then, the single incompetent individual is blown up, magnified as the representation of an entire class, because demonising that class is an easy thing, a simple explanation. Terrible mothers don't bring down ships in "On Vanishing". They bring down planes. The subject of the myth changes, but the object—the desire to explain, to place blame—remains the same. It's not mermaids pulling men underwater any more, it's irresponsible women drowning themselves in drink, and the children are suffering for it. But if the terrible mother shares the threatening nature of mermaids, so do her daughters. It's here that the two parts of Drink really come together: it's an exploration of what living with drink, what being surrounded by it, can make of you. In Drink, the daughters of an alcoholic become mermaids. Not literally, of course. They don't learn to breathe underwater. Their legs don't fuse; they don't live on fish and the folk they lure into drowning. What they share is more subtle than that. It's certainty that ties the two pieces of myth and reality together . . . the certainty of self, of what it means to be a mermaid, to be the daughter of a drunk. This certainty both strengthens and impairs. Mermaids "fear nothing. The only thing to fear is mermaids" ("Shadows," p. 24). The only thing to fear is the self, in other words. The self that refuses to die, even after swallowing a bottle of pills and being stepped over by boyfriends as it lies, still and silent on the carpet, surrounded by vomit. The self that is afraid of backsliding, of transforming into the mother, because alcoholism in a family member increases the chances of alcoholism in the self. "I don't drink anymore so there's no beer, no wine, no liquor to take a drink" ("Hit the Bottle," p. 87). Reminders of temptation, of generational repetition, are always about. A partner who collects bottles (and how much is the daughter of an alcoholic going to be drawn to others? has it happened without her understanding it?). Bottles that appear out of nowhere: "I didn't understand why there was a bottle by the sink. I didn't put it there" ("The First Bottle," p. 72). Bottles thrown into the ocean, and always the possibility of return: "You say, It will come back. I shake my head, thinking, No, some choose never to come back" ("A Bottled Message," p. 71)—the implication being, of course, that some do. Mermaids are trouble because their only danger is themselves. They're unaffected by anyone else. "Not like elves or fairies. If you stop believing in them, they don't care or die" ("Against I: Myth," p. 29). If you stop believing in a parent, do they care? If a mother's daughter is overdosing at her feet, does she remain unaffected? The rock-solid certainty of personality, this absolute cleaving to myth, is reflected in the certainty of daughter towards the mother. "Welfare Queen" (p. 43) is acid in the description of the parent: negligent, abusive, entirely absent of boundary. The daughters, in reflection, are called "Pariahs. Homeless. Whores" because certainty is catching when myths are about. They've a mythic role to play, those daughters: the next stage in the intergenerational cycle of dependency, the image of their mother. In response to sexual abuse, the girls "grew scales, bone hard and jagged, an armour". Their humanity is taken away by the indifference and determined looking-away of neighbours, when there was no-one "who would talk to us like we were human / we swam mostly alone" ("Pariahs," p. 51). Mermaid traits are thus a defence mechanism—but a double-edged one. Becoming a mermaid may protect from some threats, but it comes with certainty and risk, the possibility of turning into mother, of being so solidly set upon a rock made of bottles that the final destination really is drowning in drink. "I write, SOS. I write, My sister refused to die. I write, We are all mermaids" ("O Captain! My Captain!," p. 88). The daughters swim alone, but another poem, "The Mermaid's Sister" (p. 89) says "I don't swim, not even close", while being gifted with bottles by a lover. It's what's expected of them, anyway. Octavia Cade has had stories published in Strange Horizons , Aurealis , and Cosmos , amongst others. Her novella "Trading Rosemary" was published last year by Masque Books. She is particularly interested in Antipodean speculative fiction. You can find her at ojcade.com or on Twitter @OJCade. Octavia Cade is a New Zealand writer. Her stories have appeared in Clarkesworld, Asimov’s, and Strange Horizons, amongst others. Her most recent novella, The Convergence of Fairy Tales, was published by The Book Smugglers.